Fulton County, Ohio, is in the northwestern part of the state, bordered by Henry County on the south and by Michigan on the north. The Mennonite settlement of this region, consisting in 1955 of more than 2,600 baptized members, centered at Archbold in German Township, in the southwest corner of the county. From German Township it extended westward into Williams County, south into Henry County, north into Franklin and Dover townships, and east to Wauseon, the county seat. Archbold is 40 miles (65 km) west of Toledo and 26 miles (43 km) east of the Indiana state line. The early settlers were French and Alsatian Amish Mennonites from the region of Montbéliard and Mulhouse, the first of whom arrived in 1834. By 1850 many families had arrived, including such names as Beck, Frey, Lauber, Rufenacht, Rupp, Stuckey and Wyse. The main body of the settlement eventually affiliated with what came to be the Ohio and Eastern A.M. Joint Conference of the Mennonite Church (MC). The first meetinghouse was the Central Amish Mennonite Church, erected in 1870, two and three-fourths miles (4.5 km) northeast of Archbold. In 1908 two new meetinghouses were added: West Clinton, six miles (10 km) southeast of Central; and Lockport, six miles (10 km) west, in Williams County. In 1956 there were eleven meetinghouses, representing seven independent congregations and four mission stations, extending from suburban Toledo to Hicksville near the Indiana border, with a total of ca. 1963 members in the Ohio and Eastern Conference. The first minister was Christian Beck who had been ordained in Switzerland. Well-known Fulton County bishops in the later period were Christian Stuckey (1841-1907) and Elias L. Frey (1856-1942). In 1956 the Fulton County settlement also included one small congregation of the Reformed Mennonite Church; one of the Church of God in Christ Mennonites with 33 members; and two congregations of the Conference of Evangelical Mennonites (formerly Defenseless Mennonites), one in Archbold and the other in Wauseon, with a combined membership of 621 (1955 statistics). All three of these groups were originally formed in the 1860s. In 1956 the Fulton County Mennonites had representatives on the foreign mission field in Africa, India, and Japan. The local mission congregation was serving the needs of the Mexican farm laborers who resided in the community. In 1956 the secretary-treasurer of the Congo Inland Mission was Harvey A. Driver of Wauseon, of the Conference of Evangelical Mennonites. Fulton County leadership was largely responsible for the founding of Little Eden camp at Onekama, Michigan, in 1945. From an economic point of view the Fulton County settlement was unique in the mid-20th century because of its large number of small community industries, such as woodworking, meat packing, and the manufacture of farm machinery. Hershberger, Guy F. "Fulton County (Ohio, USA)." Global Anabaptist Mennonite Encyclopedia Online. 1956. Web. 19 Apr 2019. http://gameo.org/index.php?title=Fulton_County_(Ohio,_USA)&oldid=113794. Hershberger, Guy F. (1956). Fulton County (Ohio, USA). Global Anabaptist Mennonite Encyclopedia Online. 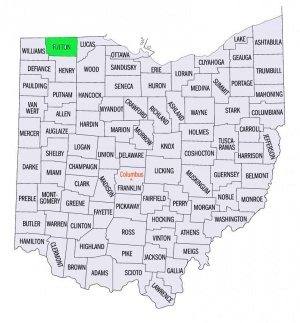 Retrieved 19 April 2019, from http://gameo.org/index.php?title=Fulton_County_(Ohio,_USA)&oldid=113794. Adapted by permission of Herald Press, Harrisonburg, Virginia, from Mennonite Encyclopedia, Vol. 2, pp. 417-418. All rights reserved.